Endoscopic sinus surgery is a relatively new procedure designed to increase the amount of air flowing through the sinuses and allow mucus to drain properly out of the nose. 35 million Americans - about 14% of the population - experience symptoms of sinusitis every year. What Conditions Are Treated With This Surgery ? Sinusitis is a common condition that usually is easy to treat with medication. It feels much like a head cold, with a blocked, stuffy, or runny nose. For most people, sinusitis is a temporary condition that goes away with simple treatment. If the symptoms continue for a significant period of time without responding to medication, or if the symptoms are especially severe, surgery may bring about permanent relief. However, surgery for sinusitis is considered a last resort and will not be recommended unless all other courses of treatment have been exhausted over a period of time with little or no results. The partition separating the left and right sides of the nose, called the septum, is sometimes crooked. This crooked condition is called a deviated septum. Some people are born with this abnormality, but sometimes it is the result of an injury. Very few people have a perfectly straight septum, but endoscopic sinus surgery is only recommended for those whose septum is crooked enough to cause significant sinus blockage. The surgery can then straighten the septum and improve breathing. A polyp, also called a cyst, is a benign (noncancerous) water-filled swelling about the size of a grape, which develops in the sinuses and causes blockage. They most frequently occur in people who have asthma. Polyps can sometimes be reduced in size with medication. However, endoscopic sinus surgery has proven to be an excellent method with which to remove polyps and restore normal breathing. A tumor is a swelling caused by an uncontrolled growth of cells that creates new tissue. It is not water-filled like a polyp. A tumor can be noncancerous or cancerous. Tumors in the sinuses are quite uncommon but can sometimes be removed with endoscopic sinus surgery. However, more extensive surgery is often necessary. The sinuses are spaces filled with air in some of the bones of the skull. Air passes in and out of these spaces, and mucus drains through them and out of the nose. They also reduce the weight of the skull and give our voices a nicer sound. 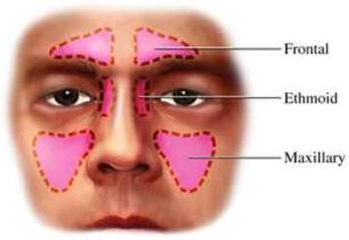 Maxillary - in the cheekbones Read More..
Each of these pairs of sinus openings has a channel that leads to the nose. These channels are quite narrow, and when the lining of the channels becomes swollen, blockage results. This lining is called the mucous membrane. This same mucous membrane forms the inner lining of the nose. The mucous membrane in the nose and sinuses is our personal air conditioner. It warms, moistens, and cleans the air. The mucous membrane creates a clear, wet, slightly sticky mucus that gathers any dust, smoke, bacteria, or virus particles that may have been in the air. Tiny hairs along the membrane called cilia act as tiny oars, moving the mucus along much like a conveyor belt through the sinuses and out the nose. When the mucus containing the unwanted particles reaches the nose and throat, the body prompts us to swallow, spit, sneeze, or cough it out of the body. When a cold or allergy prevents the cilia from moving the mucus through, the nose becomes blocked. The mucous membrane is also one of the body's front-line defense systems. It releases chemicals that help to destroy bacteria and viruses before they can attack. If a virus, bacteria, allergen or other irritant is strong enough to prevent the mucous membrane and cilia from doing their job, blockages can occur in any of the pairs of sinus openings. Endoscopic sinus surgery can correct chronic or severe blockages in one or more of the maxillary, ethmoid, frontal, or sphenoid sinuses. Most cases of sinusitis can be easily treated by a family doctor. However, in those cases where the sufferer has chronic sinusitis or repeated attacks of acute sinusitis that have not responded to medication, endoscopic sinus surgery may be the answer. This is especially true in the case of nasal obstructions such as polyps. Acute sinusitis means that the symptoms of the condition are temporary, usually lasting no more than 30 days. However, the symptoms of acute sinusitis are more severe and painful than the symptoms of chronic sinusitis. Chronic sinusitis means that the symptoms of sinusitis occur frequently or for long periods of time. The symptoms are usually more annoying than painful. However, those with chronic sinusitis are more likely to have recurring attacks of acute sinusitis, which can be quite painful. Severe headache with vomiting, a very rare symptom, indicates the possibility of meningitis or the spread of infection into the brain. How Does A Doctor Determine If Surgery Is Necessary ? The first thing a doctor will do is take a detailed medical history and make note of all symptoms, as well as how long the symptoms have been present. The doctor will need to know any medications being taken, as well as any other conditions such as high blood pressure, eye diseases or bleeding disorders. If there is another course of treatment besides surgery that has not yet been tried, the doctor may prescribe new medications. If surgery appears to be the best course of action, a CT scan, which is a special type of x-ray, is usually taken so that the doctor can see all of the sinuses prior to using the endoscope. The CT scan serves as a kind of road map for the endoscopic examination. Before the endoscopic examination, a nasal spray is used to shrink and anesthetize sinus tissues. The doctor will then insert the endoscope into the nostrils to determine what is causing the sinusitis symptoms, such as thick mucus, swelling, small openings, deviated septum, or polyps. The doctor will only perform surgery if the examination shows problems that can be surgically corrected. In very rare cases, the doctor will determine from medical history and examination that surgery will not correct the problem. In this case, sinusitis symptoms are caused by a separate condition. Those with cystic fibrosis or diseases that cause immune deficiency, such as HIV (human immunodeficiency virus) and AIDS are especially prone to sinusitis. Discontinue taking any pain relievers that contain aspirin for at least two weeks prior to surgery, as aspirin thins the blood and promotes bleeding. Make an appointment for lab tests two days before surgery (depending upon the doctor's request). Discontinue taking any other medications the day of surgery. Do not drink or eat anything after midnight the night before surgery. The surgery itself lasts 60 to 90 minutes, after which the patient spends an hour or two in a recovery room. After the doctor has determined the nature of the problem and where it is located, a surgical plan will be made. A simple clearing of the intersection between the two sides of the nose is often all that is needed to relieve symptoms. In this case, a local anesthetic, where the patient remains awake during the procedure, is enough. Some crunching sounds may be heard and a sensation of tightness may be felt during the surgery, but there is no pain. If there are several blockages deeper in the sinuses or polyps to be removed, a general anesthetic, where the patient is fully asleep, is recommended. The doctor typically begins by clearing the ethmoid sinuses, followed by the sphenoid sinuses, the frontal sinuses, and finally the maxillary sinuses, if necessary. The doctor will clear any blockages, create larger openings where needed, correct a deviated septum if necessary, and remove any growths such as polyps. Someone will need to drive the patient home, since both local and general anesthesia can cause drowsiness and disorientation for a short period of time after surgery. The nose is usually covered with a gauze dressing that will need to be changed whenever it becomes dirty or wet. A packing is placed in the nose after surgery, which requires breathing through the mouth for a short time during the healing process. The packing usually has to be worn for only a few days, and the doctor will advise when it can be removed. It may have a bad odor, however, or cause bad breath. Sleep on at least two pillows to keep the head elevated. It is not uncommon to experience discomfort in the nose and face for a short time after surgery. Mild headaches are also normal. Do not take pain relievers containing aspirin without consulting a doctor. Aspirin can promote bleeding and cause problems after surgery. Keep the nose as free from dry crusting as possible. A saline spray may be used six to eight times per day to keep the nose moist. Sometimes, the doctor will want to take care of cleaning the area in the office two to three times a week. Generally, however, the patient can make a nasal rinse from 1/4 teaspoon salt, 1/4 teaspoon baking soda, and eight ounces of warm water. A bulb syringe can then be used to squirt the solution into the nostrils whenever necessary. Keep activities to a minimum for a couple of weeks, as too much activity can increase the chances of bleeding. Do not lift heavy objects, swim, scuba dive, or fly for a few weeks following surgery. Avoid caffeine, alcoholic beverages, spicy foods, and antihistamine medications, which can cause drying of the sinus passages. Do not use decongestant nasal sprays unless prescribed by a doctor, as these sprays can become addictive after a few days of continuous use. Avoid eating dairy products, which can promote excess mucus production. Avoid anything that causes allergic reactions. Use a humidifier, if necessary, to moisten dry air. Finish all prescribed antibiotic medication. Within a week after surgery, the doctor will set an appointment to check the progress of healing. What Is The Recovery Period ? Breathing usually returns to normal within 30 to 60 days after surgery. This, of course, is a gradual process and varies from person to person. It is recommended that individuals stay home from work or school for about a week, to rest and allow the body to heal as fast as possible. Sometimes, the doctor will prescribe medications after surgery such as steroids or antibiotics, especially if polyps have been removed. What Are The Most Common Complications ? It is important to note that no surgery is successful in 100% of cases. All surgeries have the potential for complications. With endoscopic sinus surgery, as with most surgeries, serious complications are uncommon. Most complications are not serious and are easily treated with antibiotics or other simple measures. Any complications from endoscopic sinus surgery are the same as with any type of sinus surgery. While complications are infrequent with all sinus surgeries, there are fewer incidents with endoscopic sinus surgery than the more invasive traditional surgeries. The most common serious complication, which occurs in approximately 2% of cases, is leakage of the body's spinal fluid. This is usually discovered during the surgery itself and repaired at that time so that no adverse effects will occur. The worst and most rare complication is blindness, which is caused by damage to the optic nerve in the eye. Most of these symptoms can be easily corrected by the doctor if they are treated immediately. How Does Endoscopic Sinus Surgery Differ From Traditional Surgeries ? There are other types of surgeries that can correct blockages in the nose and sinuses, but endoscopic sinus surgery is becoming the procedure of choice for more and more doctors. When sinus surgery was first performed, surgeons would have to reach the sinuses by entering through the cheek area. This often caused scarring and possible disfigurement. In another traditional procedure, surgeons enter the sinus through the upper jaw. In the past, it was thought that the damaged sinus tissues could never function normally again and had to be removed. Now, it is believed that as long as enough room is created for air to properly pass through the nose, the sinuses can once again do their job. Therefore, the objective of endoscopic sinus surgery is to do as little as necessary to restore the normal function of the sinuses. It is important to prevent sinusitis symptoms from returning so that the regained sinus health can be preserved. In the case of allergy attacks, it is important to avoid allergens if at all possible, staying away from any foods, fabrics, smoke, or animals that cause symptoms. If the culprit is in the air, allergy shots or medications may have to be taken regularly to prevent a recurrence of chronic sinusitis or acute sinusitis attacks that could again create sinus blockages. Take vitamin supplements to maintain a healthy immune system. There is some evidence that garlic tablets purchased at a pharmacy or health food store can aid the immune system. Keep the nostrils moist with salt-water nasal rinses, humidifiers or steam, and saline nasal sprays. Avoid excessive forceful nose blowing. Discontinue eating dairy products until symptoms subside. Consult a doctor immediately if a fever or thick yellow or green mucus are present. Here is a summary of the important facts and information related to endoscopic sinus surgery. Endoscopic sinus surgery is an outpatient procedure used to remove sinus blockages that cause sinusitis. An endoscopeis a thin, lighted instrument, much like a telescope with a wide-angle camera lens, which is inserted into the nostrils. The doctor can examine the sinuses by looking through an eyepiece at the opposite end of the endoscope. Surgical instruments can then be used next to the endoscope to remove blockages or growths, such as polyps. Endoscopic sinus surgery is an effective procedure for correcting sinusitis, deviated septum, polyps, and sometimes tumors. To determine if surgery is recommended, a doctor will take a detailed medical history and list of symptoms, noting how long the symptoms have been present. A CT scan is usually taken next to obtain an overview of the sinuses prior to the use of the endoscope. Surgery will be performed only if all other courses of treatment have failed or if symptoms are especially severe. Endoscopic sinus surgery lasts 60 to 90 minutes, after which the patient spends an hour or two in a recovery room. As long as the patient has someone else available to drive, he or she can usually go home the same day. Full recovery from endoscopic sinus surgery generally takes 30 to 60 days. It is recommended that the person not return to work or school for about a week after surgery. Endoscopic sinus surgery has become popular among doctors because it leaves no scars and causes less pain and discomfort for the patient than traditional sinus surgeries.